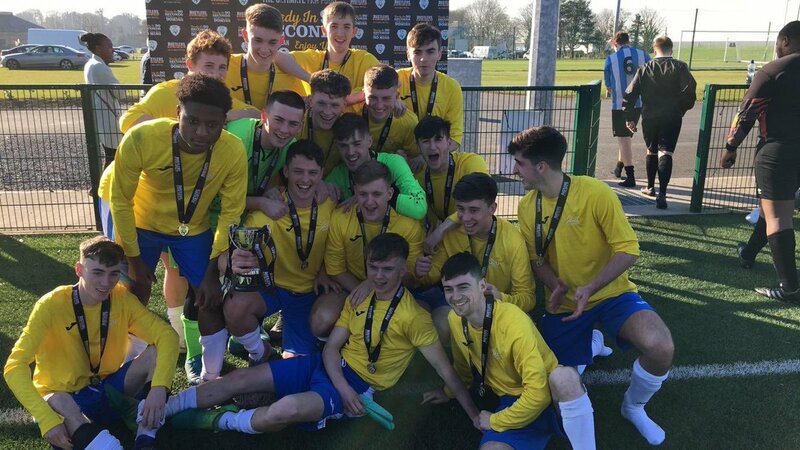 The DCU Freshers ended their season on a high note by capturing the Rustlers Colleges and Universities Division Four title with a comfortable 4-1 defeat of O'Fiaich Institute of FE Dundalk at the FAI NTC Abbotstown. An even enough first half saw the Glasnevin side managed by goal scoring legend Tony Cousins go in at the interval 2-1 ahead. Stephen Kearns had given them an early lead with an excellent finish to steer the ball past O'Fiaich 'keeper Precious Kent after been played in by the impressive Dylan Glancy. Kent's brilliant save from Runo Dortie denied DCU the chance to double the lead shortly after and following this the Dundalk side grew in confidence and hit back strongly to deservedly grab an equaliser. Top scorer Reginald John had them back on terms on the half hour when he ran on to a long ball over the top, his pace took him past the DCU defence and he confidently beat Dean McDermott with a cool finish. However minutes later Mark O'Connor restored the DCU advantage at the second attempt after Kent had done well to block his initial header but the DCU winger quickly regained possession to fire home from close range. However a couple goals early in the second half more or less sealed the win for Cousin's side. Zach Gorman made it 3-1 when he ran on to another fine through pass from Man of the Match Glancy to beat Kent. While shortly after centre back Diarmuid Sexton struck home the fourth off the inside of the far post after been set up by Kearns pin point pass. DCU 'D': Dean McDermott (Ciaran Farnan 80); Conor Donovan, Diarmuid Sexton, Patrick Barron, James Keane; Luke Lynch, Dylan Glancy; Runo Dortie (Daniel Gribbon 71), Zach Gorman (Sean Gavaghan 78), Mark O'Connor (James Conroy 30); Stephen Kearns (Dylan O'Callaghan 71). O'FIAICH INSTITUTE OF FE: Precious Kent; Jamie Doherty, Obum Onuorah, Jason McEntaggart (Josh Ayoub 53), Keelan Ryan (Shane O'Brien 63); Gerard Curran, Ben Kapinga; Jason Quinn (Cian O'Dwyer 86), Reginald John, Paul Hamill; Thomas Adeyinka (Samson Ometuso 66). Referee: Eddie Reilly Assistants: John McCarthy, Robert Byrne.